Current wood window restoration technology makes the continued use of period windows cost effective and energy efficient. We use timber frame restoration techniques which permit maximum conservation of the original historic fabric in a structurally sound repair. Combining period carpentry techniques with intimate knowledge of local historic architecture. Marlowe Restorations has been privileged to play a role in the restoration of these important historic buildings. Links to conservation products, restoration services and to organizations which support the development of preservation technology. Consultation services, including project assessments, project specifications and skills training. We can train your staff for a specific project, on site. Marlowe Restorations LLC offers a full range of consultation services, including project assessments, project specifications and skills training. We can train your staff for a specific project, on site. Marlowe Restorations LLC is a leader in applied wood conservation technology and is always striving to set the standard for best practice in the field. If you need state of the art expertise in wood conservation but are outside Marlowe Restorations' service area, on site training or assessment is often the most cost effective solution. We offer training and consulting services throughout the United States. For help with real world wood conservation issues, call the real experts, Marlowe Restorations LLC. 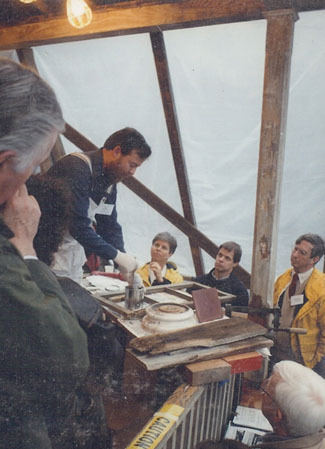 Shown at right, Paul Marlowe of Marlowe Restorations LLC demonstrates wood restoration techniques using epoxies on the porch of his 1862 home in Connecticut. The occasion is a seminar for architects presented by the AIA/CT Continuing Education Commission. Such events help designers to better understand materials so they can specify them more confidently. Tell us about your historic building or restoration project, either by email or by phone at 203-484-9643.